President Truman sent the North Atlantic Treaty to the Senate for consideration on April 12, 1949. During lengthy hearings before the Senate Foreign Relations Committee many witnesses expressed concern and dismay at the prospect that the United States would abandon a tradition of nonentanglement with Europe that was as old as the Republic, and others worried that the proposed military alliance would conflict with the purposes of the United Nations. Despite these concerns, on July 21, 1949 the Senate advised Truman that it favored ratification. On July 25 the North Atlantic Treaty was formally ratified by the President in a signing ceremony in the Cabinet Room. At a ceremony in the Oval Office on August 24, 1949, with Dean Acheson and representatives of the signatory governments gathered around him, President Truman formally accepted the instruments of ratification and announced that the North Atlantic Treaty was in effect. The NATO Treaty was signed less than a year after the launch of the Marshall Plan for European postwar reconstruction and recovery, and came at a time of increased concern at the economic and military weakness of Western Europe relative to the military power of the Soviet Union. 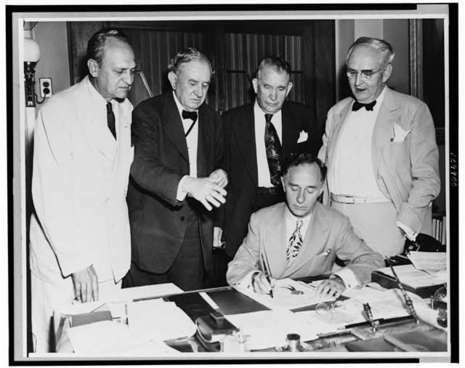 The U.S. Senate ratified the treaty on July 21, 1949. It took effect on August 24, 1949. 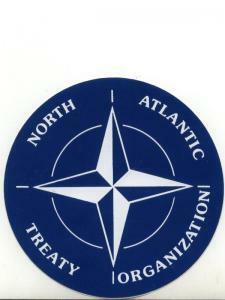 On this date (July 21, 1949), the United States Senate ratifies the North Atlantic Treaty by a vote of 82 to 13. In the aftermath of World War II, the nations of Western Europe recoginized a pressing need to seek a means of guaranteeing their freedom and security. This, they felt, could be achieved only by an alliance combining their defensive efforts. The United States also recognized this need, and thus joined NATO.